Oliver recruits Slade Wilson and Digger Harkness to save his friends, but Adrian Chase has a much bigger plan in mind. I haven't really cared for the Russia plot so far, but I'm glad they wrapped it up in this episode (and it won't drag out for another season). 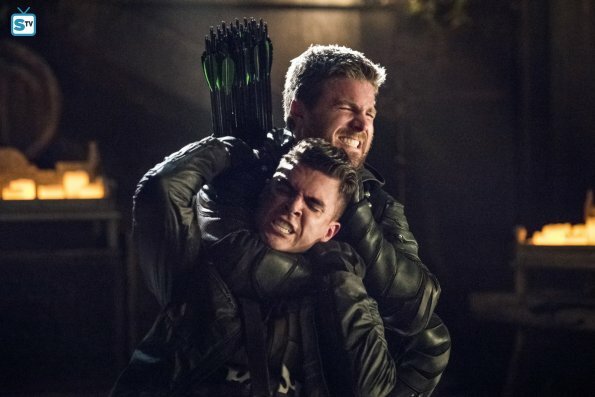 Oliver killing Kovar wasn't a surprise, but I like how the flashbacks interspersed between what was happening in present day. There was a fantastic segment of parallel scenes of Oliver fighting, running through the woods on Lian Yu, and trying to catch the boat. I also liked that it came full circle with season one, and we finally see Oliver getting off the island (with his fake hair and beard!) and talking to his mom on the phone. That part was heartbreaking. So I've been stoked about the return of Slade Wilson, and I'm even more excited now that Slade doesn't have a personal vendetta against Oliver. I'm glad he sided with Oliver and helped him, especially in order to find his son. (The parallelism!) It was awesome. I don't want to get my hopes up too much, but I'm looking forward to more Slade Wilson in the future. Malcolm Merlyn's sass is always amazing, and I love his puns. I'm glad he got over himself to help Oliver, and despite everything he's done, his love for Thea does show. It was noble that he sacrificed himself, but is he really dead? I don't believe it. I probably won't believe it even if they show his dead body because this is a comic-book show. Everybody comes back. Despite everything they went through in this episode--getting kidnapped, beat up, and locked up--I love that Team Arrow still pulled through and was willing to fight by Oliver's side. Their fortitude was amazing. Nyssa and Talia's fight was great. Dinah and Black Siren's fight was even better. But the best? Lance knocking out Black Siren was the best freaking ever. I just have to say: I knew it. I freaking knew that Felicity was going to kiss Oliver and that there was still something between them. And oh my gosh. "Just in case." I'm not okay. Not even close. Oliver. Is. Amazing. His resolve to stand for what he believes, no matter what Chase did, no matter the choice Chase laid before him, was admirable. I'm so pumped for this new Oliver Queen, and I can't wait to see what happens next with him. Ollie's been through a lot lately. It was a struggle to watch, but I think it's all been worth it. I still don't understand why any of them decided to work with Chase. Black Siren helping might make the most sense since he rescued her from her prison cell, but the rest? I still don't get it. Was it money? Revenge? I wish I knew, but the characters weren't developed enough to bother with that. I also knew Harkness would betray them... and Talia was just a big baby to run and hide from her younger sister. Bah, they were a boring lot anyways. Adrian Chase is... disgusting. His whole plan is convoluted and terrible. He made Oliver choose between everybody he loves and William, but in the end, Chase made the choice for Ollie. And I can't help but sit here and wonder... why? What was the point of doing everything to ruin Oliver's life only to shoot himself in the head so Oliver would suffer? He doesn't get to witness Oliver suffering; he doesn't even know if his plan worked. (Because honestly, how could the entire cast of the show die in the explosion? I don't believe it for a second, even if it was shocking and left me wondering.) What the heck, man? But I guess the whole thing truly came full circle: Oliver on a boat, again, watching someone shoot himself. Wow, just wow. The season as a whole has been a roller coaster. It had its high points, its low points, and sometimes I was just bored waiting for something to get started. But by the end of the season, I thought it was awesome. The last few episodes have been fantastic, building up to something mind-blowing, and it was. The end did blow me away (pun definitely intended), and I'm looking forward to season six and what's going to happen next. I think we've finally reached a good point with this show and who Oliver is as a hero. What did you think of "Lian Yu"? What are you looking forward to in season six?